LONDON, 18 February 2016 – Canon Europe, leader in imaging solutions, today sends its congratulations to Warren Richardson winner of the World Press Photo of the Year 2015. 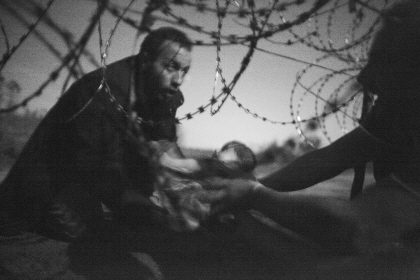 The winning photograph depicts a man and child attempting to cross the border from Serbia to Hungary at night. The pair were part of a group of people seeking to enter the country before a secure border fence was constructed. Due to the circumstance, Richardson was not able to use flash to capture the image, so the photograph is lit by moonlight alone. The World Press Photo Contest, now in its 59th year, is internationally seen as the world’s most prestigious competition for photojournalists. The judges of the contest, which has been sponsored by Canon since 1992, selected one image of 82,951 photos submitted by 5,775 professional photographers from 128 countries as the winning Press Photo of the Year 2015. There were seven themed categories, and two long-term project categories, open for contestants to enter this year. As winner of the World Press Photo of the Year 2015, Warren Richardson will receive a cash prize of €10,000 from World Press Photo at an awards ceremony in Amsterdam on 25 April. In addition, Canon Europe will award him with the EOS-1D X Mark II, its recently announced flagship camera. The prize-winning pictures are presented in an exhibition visiting more than 100 cities in over 45 countries over the course of the year and seen by more than 3.5 million people worldwide. This year’s first 2016 World Press Photo exhibition opens in Amsterdam on 16 April. This year’s exhibition displays will be printed on Canon large-format and Arizona flatbed printers. In addition, in partnership with WPP a series of 80 lectures entitled “Reflections will run in cooperation with universities across Europe telling the story of professional photo journalism and the power of photography”. Further information about World Press Photo is available atwww.worldpressphoto.org.